i love these. i started freezer cooking for the first time last week and this was my first experiment…came out so well!! Yay! I’m so glad they worked well for you! I actually did! I made baked mac ‘n cheese and had enough for 2 dishes worth, so I can have one later this week (when I work in the evening) and one for later this month! This is only the second time in almost 5 years of marriage that I’ve done this, but with a 3 month old, I think I’m going to have to do it more often. I made mac n cheese, too, and froze it! The recipe I made makes a LOT for just two people, and I wanted to use all of the ingredients up (they were going bad soon). 🙂 We just thawed ours and it was tasty! Hope yours is too! Just made these and they are fantastic! Had to try one and it was so filling. Rest in the freezer for our upcoming hectic days. Thank you for the recipe! I’ve been making these for the last year or so – since shortly after I found your blog. But I’ve customized them to suit my family’s tastes. I use ground beef (seasoned like you would for tacos) instead of the chicken and only 1 can of beans and make up the difference with rice. We all love them. And I always at least double the recipe when I make them because they do last well in the freezer. Found your site through . I love this blog. Thanks. I am going to be trying to do this with couponing as well to save money this summer. I made the southwest roll ups. I really liked that this recipe was easy and did not need to be cooked as it got quite warm here today. My husband sampled one of these are he really liked it. So I am not sure how long they will last in the freezer. I also made my own salsa for this recipe. I buy the salsa seasoning from Azure Standard and mix about 1 teaspoon of it into a can of diced tomatoes. My husband really likes the salsa made this way and I like that it is so easy and inexpensive to make. I am looking forward to making some dinners for the freezer this week. we have a recipe very similar to this but with a little more flavor….add taco seasoning and a can of green chilis, soooo good! I’m having SO much fun with this! Watching my freezer shelve get taller is a blast! Do you do anything special to the tortillas so that they are pliable when you’re making these? I don’t know if it’s our altitude, dry weather or what, but tortillas always want to crack instead of being flexible. I am going to have to use the refried bean recipe you posted tomorrow. I still have the cooked pinto beans from Friday in my fridge, waiting to be made into refried beans. I took advantage of my son’s canceled t-ball game to catch up on my freezer cooking plans. I made 20 pizza pockets and 20 burritos last night. I also made 3 small pans of baked oatmeal the night before. I love the sense of accomplishment this series brings! I’ve been making these for a little over a year now since I found your blog, and we LOVE them. They are so convenient. I just throw them right in the oven from being frozen, cook at 350 for 30 minutes and they turn out perfect. This is the recipe that got me started into freezer cooking, and I’ve been addicted ever since. Thanks for these posts, they are truly helping me to get more organized and make my life a lot easier! Love how this series is going. I had a busy day yesterday so I quickly made cookie dough for my freezer. My husband was happy! I’ve made your southwest roll ups before using only beans. They were great! This morning when I was prepping pizza dough for dinner I went ahead and made enough for 2 pizzas and popped one in the freezer. I like to par bake the crust and freeze it that way. This is the only one of the freezer cooking sessions I’ve been able to do so far but I’m so glad I did. I baked some extra chicken breasts when I made chicken strips and was able to chop it and save it until I was ready to do the roll-ups. If you’ve already got the chicken chopped, these hardly take any time at all! I’m due with my 3rd child in August and since school ends in 2 1/2 weeks I’m hoping to fill my freezer in June so we’ll have food ready to go in August! I keep following this to get ideas so I’ll be ready to go come June! When my 5th was due, the younger 4 and I worked for 3 days in the kitchen and had 30 meals ready by the time their baby sister was born. It is a wonderful blessing to have food ready! I made some banana pancakes the other day and froze about a dozen of them. They are delicious! A great item to have on a busy weekday morning, usually I don’t cook for breakfast on week days because it’s so hectic to get out of the house with our toddler. But now we can have a sit down breakfast instead of dry cereal, pop tarts, or breakfast bars on the go! I’m so glad I found this site. I started freezer cooking a few months ago and kind of gave it up. But I’m re-inspired to begin again. Hi Crystal! I don’t have ingredients for many of the things you are making yet but am making a list for when I go grocery shopping. I have about 6 tabs open due to this series. Is there a way to see all your recipes in this series together? At the bottom of each post are links to all of the posts in the series. There are also grocery lists available for each week to help save you time. We don’t have all of the recipes in the series on one post right now, but when the series is over, I plan to turn it into a downloadable ebook. Thanks so much for joining int! I’ve seen these on your blog before but never thought they looked very appealing because I’m not a big fan of refried beans. I made them tonight and ate 3. Froze the rest. They are really good! Super cheap to make. I made spaghetti sauce today…6 quarts of it in my crockpot. My MIL makes awesome sauce in her pressure cooker but one of the daughters adapted it for the crockpot. I throw it together (hubby always willing to help too) and let it cook all day. At dinner time I just have to make spaghetti and serve. I have a good size container to send home with daughter tomorrow and enough for 4 or so meals for DH and I. Tomorrow, it’s chicken paprikash in the crockpot. Hi crystal, I just finished making these. I used wax paper to roll them up in. When reheating, could I microwave the burritos in the wax paper? My husband has really been enjoying the freezer cooked foods I pop into his lunch. These are FANTASTIC! 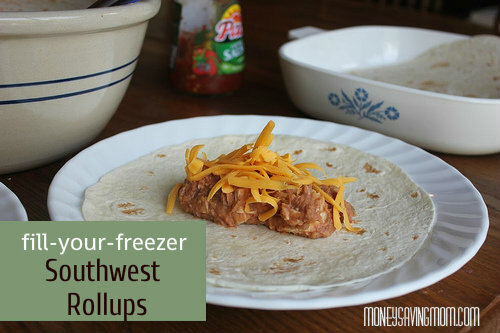 They freeze well, are super easy, and my family LOVES them! Thank you so much! Hopefully i can still comment on this. I made these yesterday and they were AMAZING! I left 6 in the refrigerator for today, and they were really soggy and spongy. My question is, are these only to eat immediately and too freeze, or is there a tip I missed? Thank you so much, your site makes my life easier.